Whether you’re at a small, intimate hostel or one with hundreds of beds, space is valuable. If you’re staying in hostels, you should pack light so that you can always be ready for the next adventure. Do your bit to be a good room-mate and keep your belongings in your area, not spread all around the room. Below are seven items you can safely leave at home. I’ve made the mistake of bringing all of them. Now I can confidently tell you that you DON’T need them. If you prefer a suitcase to a backpack while travelling, keep it reasonably sized. We’ve all stayed in dorms where one person’s suitcase was so big (and always open) that it was like having another bed in the room. Keep your bag small (preferably carry-on-size), closed, and out of the middle of the room and walking paths. Under your bed is ideal. 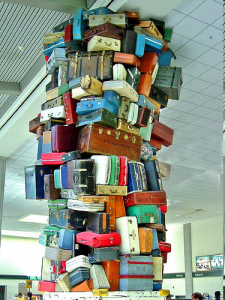 A big suitcase doesn’t help you carry more, it just weighs you down! Sleep sacks are like sleeping bags that are as thin as a sheet. They’re used as an extra sheet in cold weather and as a layer of protection from the hostels sheets for germ-averse travellers. If you read reviews before booking a hostel, you will see that you don’t have to worry about dirty sheets or bedbugs. Nothing would ruin a hostel’s reputation faster than a case of bedbugs. If a hostel is dirty or has bedbugs, travellers will leave bad reviews. You’ll find them. The biggest reason to leave your sleep sack at home is that some hostels don’t allow them. Why? Because you could bring bedbugs into the hostel. Before departing, check to see if towels are provided at your hostel. If they are, you’ve just saved a ton of space in your bag. If towels aren’t provided, or you just don’t want to rent one throughout a long trip, bring a travel-sized towel. I use the REI MultiTowel Lite but any compact, quick-drying towel will do. On my first backpacking trip to Europe, I brought a pair of heavy, thick-soled dress shoes because someone told me that I’d need nice shoes to get into some European clubs. In retrospect, I would have been much better off with boat shoes to complement my walking shoes. If you’re staying in hostels, your nights out will probably be pub crawls, backpacker bars, comedy nights and karaoke. You don’t need fancy clothes for high-end club nights. If you were partying there, you would be staying in penthouse suites, not a hostel dorm. Planning to do laundry, whether in a washing machine or by hand, is a great idea. Bringing detergent from home is a waste of space though.Carrying detergent means sacrificing valuable space in your toiletry bag if you’re travelling with just a carry on. Instead, buy it at your destination. In most cases, the detergent will be cheaper. You might even be able to buy single-use packets. Another alternative would be to carry magic soap, which can be used as detergent and as a body wash, face wash, shampoo, toothpaste and even as a general cleaner. Carrying full-sized toiletries (over 3fl oz or 100ml) means that you have to check your luggage which can be pricey. Travel-sized toiletries, while more expensive by volume, are still cheaper than the cost of checking a bag. 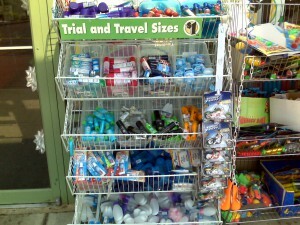 If you need a large amount of something, you can always buy the full-sized version after you arrive. Shopping in a new country where you may or may not speak the language is always a fun adventure. Some brands don’t make travel-sized versions of their products. In those cases, use refillable, travel-sized bottles. You can find cheap ones at any drug store. A decent smartphone is 90% as good as most point-and-shoot cameras. Since you’ll probably be carrying an unlocked smartphone, use it for picture taking instead of a separate camera. You’ll be able to take advantage of photography apps to improve and share your pictures. Higher-end DSLR cameras are a different story. They are far superior to smartphone cameras. However, they will also take up a lot of space in your bag or necessitate a separate camera bag. By leaving the above items at home, you can lighten your load, free up space in your bag, and avoid incurring the wrath of the TSA. *About the author: Fred Perrotta is the co-founder of Tortuga Backpacks, makers of the ultimate travel backpack. If you’re travelling from city to city and staying in hostels, check out the carry-on-sized Tortuga Travel Backpack. Whats so special about a Tortuga Backpack? You can carry everything you need without having to check your bag, plus its easy to pack and is lockable. Want to win a Tortuga Backpack? HI-USA are giving you the opportunity to win a Tortuga Backpack when you share your feedback on eco-tourism through a short survey. Don’t forget HI-USA are one of the 15 countries that you can vote for in the bid for the HI-Sustainability Fund. Here at HI, we’re serious about sustainable travel. 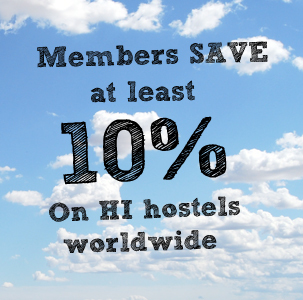 That’s why we’ve set up the HISF (HI Sustainability Fund) – a project to help hostels reduce their CO2 emissions. We need your help to decide which hostel is going above and beyond to become more eco-friendly. You have until 30 September 30 to place your vote, choosing between 15 different countries, your vote can really make a difference, read more here. Love the article and totally agree with anything until the point about leaving your camera behind. If you’re planning on having a trip of a lifetime I’d recommend a camera over a phone every time. I don’t leave home without mine. This is a great list! Especially Part 2. Sleep sack. This is just not necessary, but however you may need it in case you wanna go camping as well on your trip. #7 Point-and-shoot camera: I agree, but here it needs to take into account, that some cameras of smartphones are low-budget, and the quality is even lower. Some small Point-and-Shoot-Cameras may be useful. Check out the quality before. But sure, in case your phones camera rocks, you can save time, weight, and nerves because you have to worry about one thing less. Quick note: I started myself taking an old-fashion camera with me, plus an underwater one. Great photos! I do carry laundry detergent since I prefer detergent without fragrance. Among other things, clothing washed in laundry detergent with fragrance is more likely to attract noxious flying insects (e. g., yellow jacket wasps, honey bees (the important to agriculture specie of bee), mosquitoes, etc. On a long tour it becomes very expensive to continually purchase this type of laundry detergent. Magic soap might be a solution if I could find it! Non-fragrance detergent is not sold in single use packages. Recently I have taken to carrying 2-3 “ultra packs” of fragrance free detergent in a small 2 oz./50 gr. to 4 oz./100 gr. plastic container. Of course I have to leave the other 16-14 “ultra packs” of detergent at the hostel for others to use for free. In doing this does keep the weight of my pack or bike panniers low! The ultra packs are biodegradable. “leave your camera at home” Bwah ?! I leave the phone behind ~!! Carry detergent, its foolish not to with the advances in detergent technology. Purex invented a way to put detergent and fabric softener in a pad that’s a bit thicker than a standard dryer sheet. If you have room for an extra notepad, you have room for several of these sheets… They’ve proven to be a WONDERFUL backup when Laundromats don’t have detergent stocked (or when you may not want to use the available detergent). I also cut the sheets into 1/3’s when I sink wash my socks/underwear… I hate taking more than a couple pairs… And the pads aren’t liquid, so they’re not even on TSA’s radar (store them in a Ziploc, otherwise they can stain your clean clothes) Lastly, I always carry a dry-erase marker, I can leave notes on any mirror or glass surface without finding paper or causing damage. Another reason to disagree with the “Camera” entry; if you are going to a place where you could be mugged, it’s better to lose a camera than to lose a cell phone (unless it’s a super expensive camera). So if you want to either leave your cell phone at home or leave it in the hostel locker, it would make sense to bring a camera instead. Don’t listen to the person who wrote this article. You can go to high end bars and restaurants even if you’re staying in a hostel. No average person wants to stay in a luxurious hotel room in Europe. You might as well just stay in your home country in a luxurious hotel room if you plan on spending your whole day there. All you want when you go to Europe is a clean place to lay your head at night. You will be spending the day out, so why waste money on a luxe hotel? I agree with Masha. #4 is bad advice coming from a bad, presumptuous premise. Lots of people rather save on lodging and spend the $ out. In my hosteling days plenty of high end places were in the mix of different types of places I went. If you only go on pub crawls with your fellow back packers, who don’t care how grubby you are because everyone is doing the same thing, you are missing out on where ever you are. Whether it’s high or low end, you want to get out, blend in, and mix with the locals. The key isn’t packing fancy clothes, the key is packing smart and choosing things that can do double duty (black logo free merino can taken you from the trail to the theater to the club like nothing else). And some strategic accessorizing. In my younger days I was at some hip, very non-touristed bar in Amsterdam. I met a group and they were shocked when I told them the hostel where I was staying because I absolutely did not look the part. They actually thanked me for not being a stereotypical backpacker just because I was a budget traveler. One of them invited me over for dinner. More useful advice would have been how to look sharp without bringing extra stuff.